Sorbitol is the most common of polyols. ...read more..
(3) pure dextrose monohydrate or glucose syrup of a suitable DE dependent on sorbitol specifications. 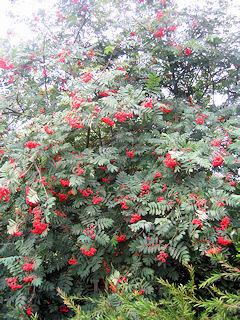 Vitamin C may be manufactured by the Reichstein-syntesis with the following steps: Sorbitol, sorbose, diacetonesorbose, diacetoneketogulonsyre and final rearrangement as vitamin C.
Sorbitol is a sugar alcohol, C6H14O6 found in nature as the sweet constituent of many berries and fruits best known from Sorbus aucuparia (Rowan or European Rowan) from which it was isolated for the first time in 1872. Hydrogenated starch hydrolysates (HSH), - polyglycitol syrups - are found in a variety of foods. They serve as bulk sweeteners, viscosity or bodying agents, humectants (moisture retaining ingredient), crystallization modifiers etc. just like sorbitol. Sorbitol has four crystal structures - four anhydrous crystalline phases plus the hydrate. It may be crystallized from an aqueous solution or low moisture melt or even spray dried / spray crystallized. Gamma polymorph is the most stable of the anhydrous crystalline forms confirmed by its high melting point and low hygroscopicity and is the only form of significance for the confectionery and pharmaceutical industries. The front end design depends on the selected agro commodity. The attached diagram shows briefly the process route. The various designs are described in greater detail in respective Technical Memoranda. A review on sorbitol safety as been assessed by the Joint FAO/WHO Expert Committee on Food Additives concludes that it is not necessary to limit the dietary intake of sorbitol and related sugars. Nor has the Committee specified an Acceptable Daily Intake for Sorbitol. In the Code of Federal Regulations, FDA notes that sorbitol is used in food at levels not to exceed good manufacturing practices. These regulations further require that any sorbitol-containing foods whose consumption would add 50 grams of sorbitol to a persons diet must be labelled with the statement, Excess consumption may have a laxative effect. In USA use is regulated by FDA. A maximum level of 99% of sorbitol may be used in hard candy and cough drops, 98% in soft candy, 30% in commercial jams and jellies, 30% in baked goods and baking mixes, 17% in frozen dairy desserts and mixes and 12% in all other foods. Sorbitol has a smooth mouth feel with a sweet, cool and pleasant taste. It shares many applications with propylene glycol and glycerine and glycerine provides hard competition in the market for humectants. Sorbitol acts as a crystallization modifier or inhibitor; it can prevent syrups from forming crystals of sugar. It is used to add body and viscosity to mixtures, and can protect against damage from freezing (cryoprotectant) and drying. Liquid sorbitol itself has a tendency to crystallize at room temperature. A product of choice for most applications is non-crystallizing sorbitol (NCS) - a 70% solution with approximately 50% sorbitol and smaller amounts of other polyols (maltitol a.o.). 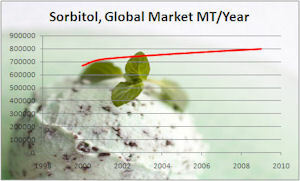 Global production of sorbitol has reached approximately 800.000 MT per year. Sorbitol being the most commonly used polyol (it is the least costly) held the biggest market share among similar polyols. Roquette Freres is the world's biggest sorbitol producer. Together with Cargill and SPI Polyols they hold a market share of over 70%. Roquette has set up several production bases worldwide and is also constructing a large sorbitol plant in the east of China. In tobacco industries, sorbitol may give mild effect in sniff, good humectant agent, and avoid acrolein formation which formed in burned glycerine. Sorbitol is used as softener and colour stabiliser in textiles and as softener in leather industries. The manufacture of vitamin C consumes approximately 15% of world sorbitol production. Gluconobacter oxydans are used for the oxidative conversion of D-sorbitol to L-sorbose an important intermediate in de manufacture of L-ascorbic acid (Vitamin C). A possible pathway of sorbitol metabolism is via fructose and glycogen to glucose. This process is slow. In trials no significant increase in blood sugar were observed after intake of ice cream with 35 g sorbitol. The low glucemic index explains the interest for sorbitol in diabetic foods. Sorbitol is actually a nutritive sweetener with 2.6 calories per gram. Table sugar has 4 calories per gram. Slimming foods take advantage of this difference in calories and add artificial sweeteners to compensate for the lower sweetness of sorbitol. Sorbitol does not promote tooth decay; it is resistant to metabolism by oral bacteria which break down sugars and starches to release acids that may lead to caries. In toothpaste around 20% of the sorbitol market - it serves as a humectant, bodying agent, sweetener, shelf-life extender, crystallization inhibitor. It competes with the sweeter xylitol, but in many recipes, they act together. Sorbitol is an obvious choice for chewing gums and non-cariogenic confectionery. It is far better than table sugar. It adds sweetness with no risk of tooth decay. Oral-care is in fact an important market with toothpaste, chewing gums, mouthwash and breath fresheners as top sellers. Sorbitol retains moisture on the skin and leaves it feeling soft. Up to 5% is used in creams, lotions, gels, lipsticks, masks, shaving cream, aftershave lotions, shampoos and hair conditioners. Sorbitol is also number one, when it comes to clarity and translucency as in transparent bar soaps and translucent gels.